The first satellite of the European Union’s Copernicus project, Sentinel-1A, is due to be launched next Thursday, April 3rd. The project aims to create a constellation of satellites providing a range of Earth Observation data to aid our understanding, and management, of the planet and its resources. Sentinel-1 is a two-satellite mission, with a second identical satellite, Sentinel-1B, due to be launched in 2016. The two satellites will orbit the earth 180° apart, allowing the entire globe to be covered every six days, although the Artic will be revisited every day and Europe, Canada and main shipping routes every three days. 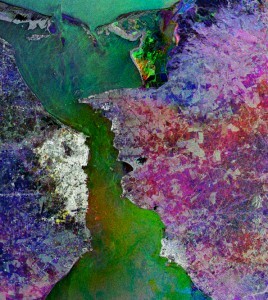 The Sentinel-1A satellite weighs 2,300kg and carries a 12m long C-band Synthetic Aperture Radar (SAR) instrument; this is an advanced radar system that transmits microwave radiation that allows it to capture images of the earth twenty four hours a day, in addition it get images through cloud and rain. This is particularly useful when providing imagery for emergency response during extreme weather conditions. The satellite also has a pair of 10m solar wings to provide independent power, the deployment sequence can in be seen in this European Space Agency video. Over land Sentinel-1 will capture data in an Interferometric Wide swath mode, which means it takes three scans and then combines them into a single image. Each scan has a width of 250km and a spatial resolution of 5m x 20m, which means each pixel on the image represents a 5m x 20m area. It works slightly different over the oceans, operating on a 5m x 5m spatial resolution enabling the direction, wavelength and heights of waves on the open oceans to be determined. Lake Maracaibo itself is also really interesting. It was formed 36 million years ago and is the largest natural lake in South America; although it has a direct connection to the ocean and so could be called an inland sea. The port of Maracaibo, located on the west side of the strait (large bright area on the image), is the second city of Venezuela and the lake is also a petroleum-producing region supplying two-thirds of the total Venezuelan petroleum output. However, its biggest claim to fame is atmospheric phenomenon of a semi-permanent lightning storm where the Catatumbo river flows into the lake; making it a magnet for stormchasers the world over. This entry was posted in Copernicus, Earth Observation, Envisat, ESA, GMES, Research, Space Industry, Understanding Space and tagged Copernicus, Earth Observation, ESA, European Union, Lake Maracaibo, Rio Catatumbo, SAR, Sentinel-1, Sentinel-1A, Synthetic Aperture Radar by Andy. Bookmark the permalink.